Our last and final leg of our Honeymoon is a strong contender as my favorite place in Bali after exploring for two weeks! If you need a recap you can read about the first stop of our honeymoon in Seminyak, then Nusa Lembongan, and finally arriving in Ubud! Ubud is the cultural heart of Bali and is know for it's beautiful temples and iconic rice paddies. 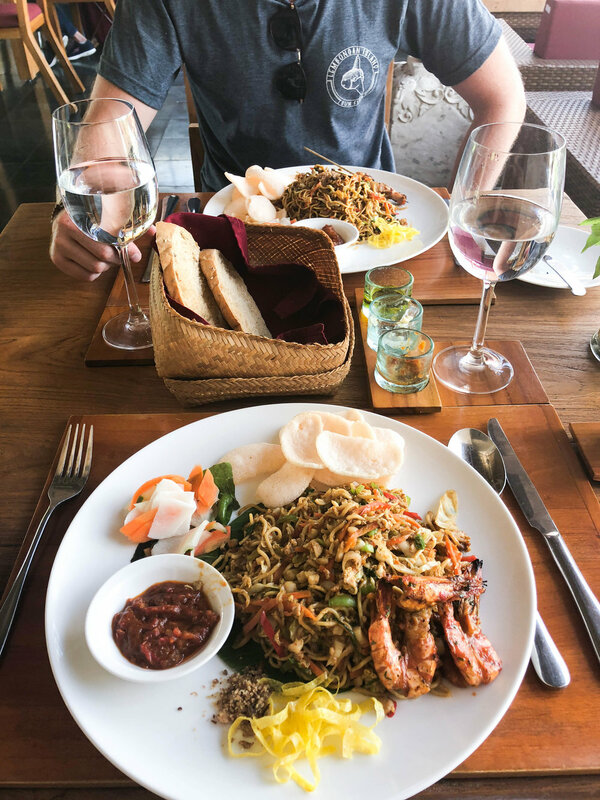 We spent our last 5 days in Ubud, winding through rice paddy fields in our scooter, lounging by the pool and eating as much mie goreng as we could handle! After taking a boat from Nusa Lembongan to Sanur we took a 1.5 hour taxi ride to get to Ubud and only paid $10.50! And that was with tip! We arrived at The Udaya Resorts and Spa and were in instant heaven. The bathtub was UNREAL. It looked out over lush greenery outside our window - I would have been happy just living in that bathtub for 5 days, but lucky us that the room and private pool were just as amazing as the tub! The food at the Udaya was fantastic as well! We had breakfast every morning in the restaurant overlooking the rice fields - not too shabby sipping your morning coffee with that kind of view! There are many other great places in Bali that we didn't get the opportunity to try, but here are some of our highlights and favorites! Laromona - Our favorite meal of our entire stay in Bali! The laramona platter, mushroom risotto, and the blue cheese and mushroom bruschetta were all incredible - and we loved drinking sangria out of teacups! Warung Città Ovest - When all you want is a slice of pizza! It's around $4 for a whole pizza! Clear Cafe - A little touristy, but still a fun place to grab lunch. Bridges Bali - This was our priciest dinner in Bali, but such a fun and romantic night out! Watercress - If you go to the Monkey Forest, stop at Watercress after and have an amazing lunch! Try the amazing veggie burger and the ham and cheese toast. Kismet - Our second favorite in Ubud! We had dinner here on our first night and loved it so much that we came back to lunch the next day! I didn't take a picture, but make sure you try the Black Pumpkin Ravioli! Visit the sacred monkey forest! We were so mesmerized by these little rascals! They are mischievous little suckers that's for sure. I loved seeing all of the little babies hanging on their momma's. Make sure you don't have food in your pockets or purse even! We saw several monkeys running up peoples legs trying to grab food! 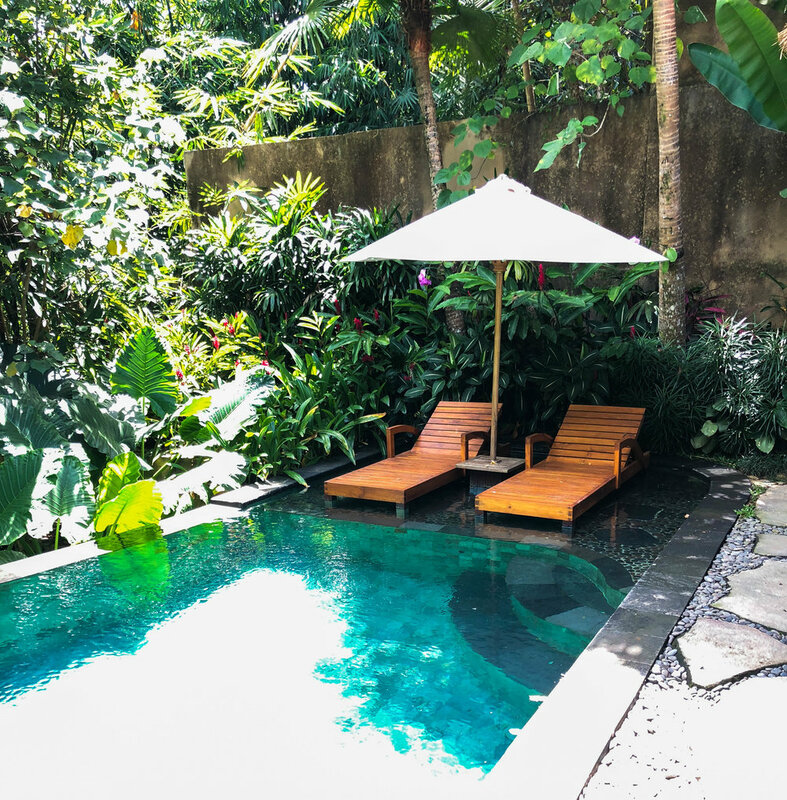 This is an absolute must in Ubud! Just make sure you wear comfy shoes since it's a lot of walking! There is a beautiful temple on every corner in Ubud. Some of the most well-known ones are Tirta Empul, Goa Gajah, and Gunung Kawi Sebatu which is the one where we took pictures below. In many temples you have to wear a sarong around your waist - if you don't have one they usually have some at the temple for you to use! One of the. most important things - relax and enjoy your vacation! Our favorite thing is to enjoy a drink and good food on vacation! If you want a good cocktail - head to Kismet! But keep in mind, alcohol is heavily taxed in Bali so you're likely to pay $8 or $9 dollars for a drink! If you're keeping to a budget, stick with Bintang! Last but not least, get a tat!